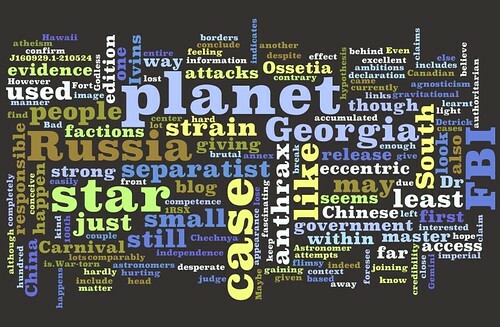 To get another look at what I've been talking about, I've used Wordle yet again to generate a word cloud for this blog. Compared to the last time I did so, it seems I've been a bit more balanced about what I've been blogging. I'm not sure if this is a good or bad thing. The migration of Stochastic Scribbles from Blogger to a self-managed WordPress installation is now complete. The blog is back up and running. I will be migrating Stochastic Scribbles to a self-managed WordPress installation, so in the meantime I will be turning off all comments in this blog. And don't worry if no posts are made for a while; I'll be spending all of my free time in moving the blog. You'll know when the move is complete when the blog suddenly looks different and comments can be made again.